The oven door swung wide. Damp, rye heat billowed from within. Knotty hands slid a wooden peel into the depths, produced a gold and crackly loaf. The sweating baker set it on a rack, delved back for another. Twelve more joined it, steaming from slits in their crusty flesh. Nearby, a bell chimed. A stamping of worn boots tracked snow onto the warm tiles of the bakery. The baker set down his peel, rounded the corner to his counter. There, framed by a frosty streetside window, stood a raggedy fellow in a blue coat. His cheeks were bitten red by wind; his eyes dim and drear as the winter morning. The man gave a chap-lip smile. "And the rest yerself." He perused the counter and shelves, piled high with fresh, flakey loaves, buns, and biscuits. A gummy air of warm grain pervaded the stock. Slow, he turned a pair of worn silver coins in his hand. "What can I do ye?" said the baker, pawing a kerchief to his brow. "Got some curd in from the good goatmice down the lane, today, and a bit of red wine, too." The blue fellow tongued a split lip, considered. Behind, the door chimed. 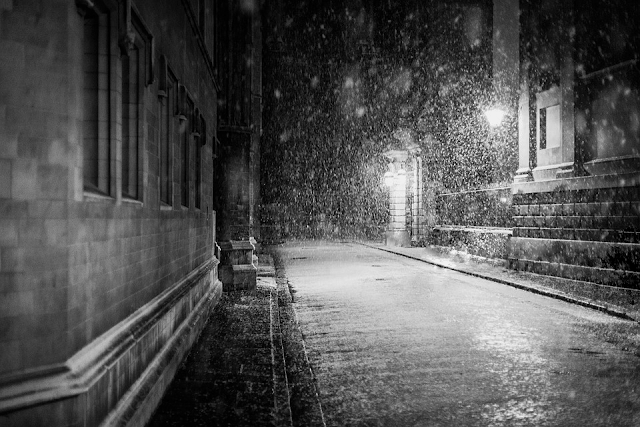 A woman in a bowler hat entered, brushed snow from her cape. She flicked an eye to the fellow, considered him briefly, began perusing the bread and wine. "How much're those?" said the man, pointing, glancing to the baker. "A penny half," replied the baker. "Aye." Scarred hands gripped the coins. "Can you do me a heel o' sour and bit o' the curd for a penny?" As the baker bundled his sale in brown paper, the behatted woman set a bottle of wine and two loaves on the counter, waited. The man in blue watched, massaged his hands. They quivered only slightly. "There," said the baker, handing over the bundle. A dot of silver met his palm. "Methanks." They nodded. The bell chimed. The man in blue stepped into the snow and early morning dim. Flakes and chimneysmoke drifted down the white and narrow lane. Few folk traversed the troughs worn in deep snow. As he shuffled, the man unwrapped his package, tore off half the meager hunk of bread, and a bit of curd. He chewed, eyes half shut against the wind, clutched his collar closed. The fellow in blue turned. Behind him, under a streetlamp, a white glove flashed above a bowler hat. He raised an eyebrow. The woman approached, gripping a market bag, scuffling snow. "Pardon, good Master." She extended a hand. The man took it, uncertainly. "Petre Portgart, of Silton. I couldn't help but notice your coat." The fellow swallowed hastily, shook. "Alfred Dole, Windour. I–"
"Uh, aye. I was." Dole's gaze flicked to the brass buttons, some missing, on his coat. "I thought so. You've the look of a soldier, anyway. Wounded? "Ah, no. Discharged. Didn't fit in." "A shame. No pension, then?" "A right shame. Crown should support her people." Portgart shuffled her feet in the snow. "The reason I ask, Master Dole, is that I wondered if you're looking for more work of a soldiering sort." "My employer, Tiber and Fellowes," said Portgart. "Is always in need of good folk like you." "Quite. I'd like to offer you a job, on T&F's behalf." Portgart handed him a pamphlet. It showed an inked image of armed and armored folk ferrying gold from a ruin in a hilly land. Above the image was inked a slogan in bold plate. "A land of plenty," mouthed Dole, sounding out the block letters. "Venturing. A trade of great reward, for those who are good at it. Soldiers, Master Dole, tend to be very good indeed." "Indeed. To the rich Eastern frontier." "Good. Hate it 'ere" said Dole. "Soldiers hired by Tiber and Fellowes are known to achieve standing four within a year," said Portgart, rubbing her gloved hands. "A full-percent cut of profits from a given venture." "Usually it's in excess of a hundred pounds, for a raid,** not including benefits." Dole's eyes went wide. "Where do I sign on?" Portgart grinned, handed him a card. "Take this and show it to the desk at the consortium. They'll help you from there, including a coach." Dole took it, nodded, shook her hand again. "Methanks, Master Portgart." "Thank me again when you're standing four." Dole grinned, began to turn away, card raised in a sort of wave. "Master Dole!" said the woman. "One more thing!" Dole looked inquisitive. Portgart produced a bottle of wine from her bag, handed it over. "Let's call this the first of many benefits." Fat, hard snowflakes pattered on the plate glass. Fractals of gold leaf patterned the pane's corners like clutches of frost. Only congealed breath clouded the pristine, chill crystal. Grubby fingers pressed to the windowpane, followed by a snub nose. Stoat marveled at the darkening mountain view, all sharpened peaks and black-green valleys. "Stoat," decried a high voice from the woman's shoulder. A mouse perched there, clung to oddly-white locks. "Get your filthy mitts off the glass. You're leaving marks the size of oranges." Stoat rolled her eyes, pulled away from the floor-length glass. "Is this what I get for giving your little pork-arse*** a ride, eh?" she said. The mouse harrumphed. "She's a menace, Lilé." "Let a lass marvel, Nils," said Lilé, near the hearth. She lay upon a chaise lounge, stretched her gangly, green silk-wrapped limbs. She fixed Stoat with amused, bloodshot eyes nestled in cloth. "Quite a benefit, this place"said Stoat. "I've rare seen such glass, outside of the Isles." She looked about, took in the peaked pine ceiling, the velvet furnishings, the beds and their pressed sheets. "Nor such finery. And so high up. How do you think they lifted it all up to the shallot?" "Chalet," corrected Lilé. "Belviriners† are quite used to building in the mountains, mon amour." "Really, Stoat," said the mouse, wriggling his nose. "For a would-be sophisticate, your class falls quite short, outside of Firlund." Stoat patted the mouse. He cringed. "Now, now, Nils. I've got no want to be a snob. I just like snobby things." Nils huffed pitchily. "That might explain why you're wearing bloody leathers in a Teljor resort." By the fire, Lilé rolled her eyes. "Lads, let's not squabble now," she mumbled. †† They ignored her. "Mark of our trade, mate. Wear them with pride," said Stoat. "'Mark of our trade,'" scoffed the mouse. "The mark of our trade is a remarkably short life expectancy, Stoat." "And a good deal of benefits, if you get good at it," said Stoat, gesturing about. "So, you're saying we're on a luxury holiday because we got good?" A wicked glitter entered Nils' red eyes. "Whereas Gar is dead because he didn't?" At this, Stoat's face fell. By the hearth, Lilé flinched. She watched the two uncertainty. "Come off it, Nils. You know I wouldn't mean that" said Stoat, softly. Nils hunched on her shoulder, quiet, furry face inscrutable. Breath flickered in his round body. His long whiskers twitched. Eventually, he clapped a conciliatory paw on her other shoulder. "Of course not. Cruel of me. Nor would I." He gave a sigh. "We've all known the risks." Stoat nodded, smiled thinly. "Aye." Lilé rose, crossed to the pair. She placed a wrapped hand on Stoat's free shoulder. "Come" she said. "Let's forget for a while." "Aye" said Stoat. "Let's just see what end of benefits we can find." Banks are in the business of getting people to do awfully dangerous things. There's a lot of gold in deep and dangerous places, and banks need cutters to delve and get it out. In payment, banks promise a cut of the gold to be retrieved. ††† Such promises of wealth form the greedy backbone of the venturing pay scale. To satisfy their greedy cutters, banks employ a leveled system of "standing." The higher a cutter's standing within a venturing firm, the greater their earned benefits. Standing is increased only by successfully completing ventures for the bank. Benefits, depending on the offering firm, may vary. Usually, early standing tiers include housing and transportation benefits. Others, some resupply and armament bonuses, especially within raids. The greatest benefits include funded holidays at bank-associated luxury locations. Every standing level also carries access to greater cuts of the venturing yield. As an example, the standing and benefit progression of the most notable Northern bank may be found below. T&F award new standing levels as cutters complete ventures. They track this via a point system attached to the cutter's venturing license. Interior pages, much like passports, are devoted to stamps denoting completed ventures and associated banks. Such records are also kept by the banks, for cross-checking purposes. Point values for completed venture are determined on a bank's assay of the venture to be completed. Small ruins and non-ancient jobs, such as debt collection, are worth only a single point. More substantial, riskier ,more valuable tombs are worth two. Raids, wherein a majority of participating cutters will die, are worth 4. Banks will often tempt folk to participate in raids with the prospect of immediately becoming standing two. Standing 1: (1 point) Verified T&F cutter stamp. Priority signup for ventures. Receive increased venture cut, est. .6%. Loan at 20%, depending on performance. Standing 2: (4 points) Transport provided to and from venture site. Additional supplies afforded, as appropriate. Receive increased venture cut, est. 1%. Loan at 18%, up to 5 crowns. Standing 3: (8 points) Complimentary food and housing provided between ventures, usually at local inn or hostel. Sponsored access to local luxuries. Receive increased venture cut, est. 1.4%. Loan at 12%. Standing 4: (12 points) Complimentary stay and service in T&F-associated luxury locations after every 3 points. Receive increased venture cut, up to 1.8%. Loan at 10%, up to 10 crowns. Standing 5: (24 points) Complimentary invite and all-inclusive attendance at T&F balls and events. §§§ Receive increased venture cut, up to 2.2%. Loan at 5%. Optional pension at 30+ points. Promises of eventual, lavish reward are oft bandied by gossiping, hopeful cutters and predatory, enticing recruiters: Tales of comfortable cutters, retired in the peaceful country. Stories of tomb-raiding stars, now ascended as rich and enviable élites. Myths of wise cutters who somehow played the bank at their own deliciously entrapping game. Rarely will a cutter bestowed with such success and wealth been seen, though. Cutters in service to the banks of the Coast, whether over years, months, or a single, fateful venture, most often meet not fame, wealth, and comfort; but debt, insanity, and a miserable end. A cutter is not a creature dissuaded by the spectre of an awful end, though. Their very trade is based on the braving of danger in exchange for gold. To a them, no danger at all is too daunting, if attached to a sufficient promise of wealth. The above T&F table serves as the base of my own venture progression tables. Any changes at all are fully well acceptable, if the reader deems appropriate. I am loth to put too much of the banks' arcane bureaucracy down in print, anyway, lest it lose a believable aura of terrible complexity. I will likely fill out the benefits more, as I recall ideas. * Folk of the North are apt to greet each other with variations of "top of the morn to you," instead of "good day." "Top of it," "top to you," or simply "top" are most common variants. One should traditionally respond with "and the rest of the day yourself," "the rest yourself," or "yourself." ** A raid is the largest, deadliest variety of venture administrated by banks. These are often multi-month delves into complexes of exceptional depth and horror. *** A pork is a small, soft-bodied rodent, somewhat like a small mouse. To compare a mouse to a pork is highly insulting. † Belvirine is a smallish, mountain country situated northeast of Maples. Its lodges and slopes are a popular aerial getaway for the rich. this manifests as defensive argumentativeness. buy (or claim to have bought) the land where it resides. ‡ Given that few cutters live long enough to see greater rewards, banks suffer little expense of matter when treating those who do. The prospect of generous benefits is also useful in the recruitment of new cutters. ‡‡‡ This is, cleverly, precisely the cost of a venturing license. § Coastal banks usually charge cutters interest at a monthly rate. §§ Cuts vary depending on a given venture. Figures given with standing raises are mere estimates. Nevertheless, the increase is felt. Cuts usually increase commensurately with fatalities. A .2% share becomes much more appealing after a few fellows have died. Despite this, a venture which only yields a few crowns or so remains disappointing for cutters and bank. §§§ Banks are eager to show off their most successful cutters to partners. Attempts to clean up a hard-worn cutter for a formal event can often be half-successful. Attempts to conceal the accompanying laudanum addiction, less so.